Why is image quality important to pathological specialists? What changes have there been in recent years within pathology to increase the popularity and need for the highest quality microscope camera? 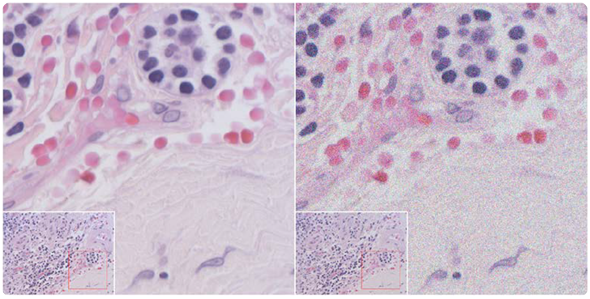 Recent advances in technology have allowed camera systems take advantage of faster protocols, and to use sensor chips with greater light sensitivity and reduced output noise to deliver better image quality, detail, and response to the pathologist. Ilium Brownii (INFINITY3-3UR). 10x Objective, 10 ms Exposure, 1.2x Gain, 1.0 Gamma. Imaging systems have been developed that can perform whole slide scanning. These systems depend on cameras with reliable color and uniform output. Better global communication networks allow pathologists to provide their expertise to remote communities or to provide images that show the results of tests performed off-site. When a pathologist captures new images or accesses images collected by someone else, it is critical that they accurately represent the available information. Inconsistent or poor quality images will have a detrimental impact on their usefulness. Whether the camera output is observed live on a monitor, captured and archived, or shared over the internet, it is essential that the color and detail present in the tissue sample is accurately represented. 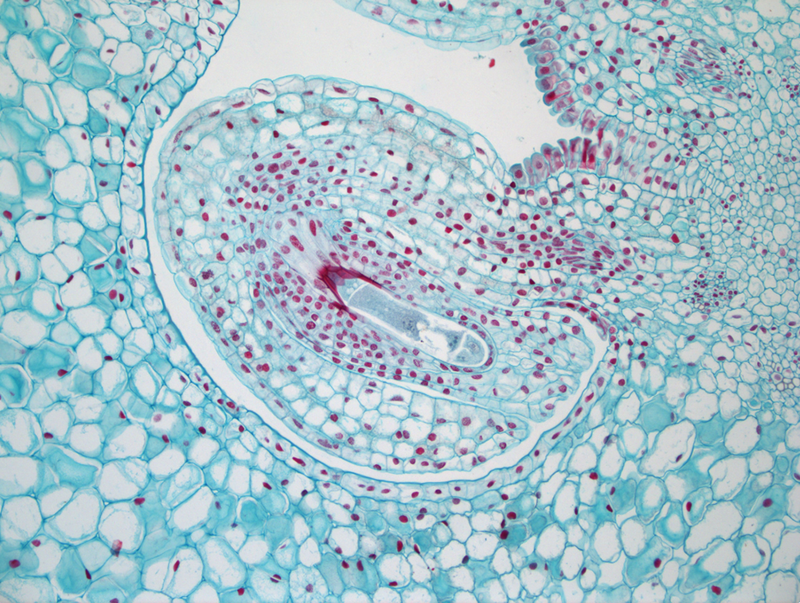 How varied are the pathological applications for camera microscopes? How varied are the requirements between these types of applications? Digital cameras provide the pathologist with capabilities that range from the simple ability to record or archive what they observe, to being able to conduct quantitative analysis to detect shapes, patterns, or take measurements. Multiple high-resolution images can be collected, and assembled into digital representations of an entire slide. In certain applications the observation of the slide sample requires modulations to the light source including color filtering, phase-contrast, differential interference contrast (DIC), fluorescence, etc. Cameras used under more challenging or complex lighting conditions will need to be more sensitive and capable of producing quality images where less light is reaching the camera. Including a digital camera on a microscope system can provide the immediate benefit of reducing the time spent looking into the oculars, thereby alleviating eye strain. The microscope camera will display the image for the technician or pathologist to examine on the monitor in real-time. This also means that any sample placed under the microscope can now be observed by several colleagues, or by a room full of students. Please describe why color reproduction for pathological images is important? Pathologists rely on slide preparation techniques that involve the careful staining of the tissue samples to highlight areas of interest or to reveal potential problem areas. Subtle shifts in color can indicate areas that would contribute to a diagnosis or could rule out suspected problems. Accurate color representation is not only important while observing an individual slide, but also for consistency when comparing images of the current sample against archived images. What problems are there with cameras that automatically post-process their images or those that aren't calibrated correctly? Calibrating the camera for white balance, and adjusting monitor settings to accurately display images are steps that every microscope camera user should undertake. A correctly adjusted camera will repeatedly deliver images with reliable color representation. A camera that is configured to automatically adjust to changing light conditions or scene content (such as smart phones or point-and-shoot cameras) will produce inconsistent image colors. How does the color reproduction affect images that need to be further artificially colored in post processing? Camera settings (such as white balance, exposure, gain, gamma) should be configured for the optimal performance on the microscope system (including lamp type, filters, etc.). The goal is to capture images that accurately represent the slide sample content, without need for post-processing. In some instances, it may be beneficial to highlight a particular area of an image by performing some post-processing, but less is always better. Each time an image is manipulated through a software alteration or enhancement, some content is compromised. Please explain quantum efficiency (QE) and the association with exposure time when getting the highest quality images? The QE rating for a camera is an indication of how responsive the camera will be to the available light. For a color camera, the pixels will collect the incoming light in the Red, Green, and Blue ranges of the visible spectrum, through the colored filters that cover the pixels on the sensor surface. The exposure time required to produce a quality image will depend on the spectral content of the light source, and the amount of light reaching the camera during the image acquisition. A camera with a high QE value can use a shorter exposure time to obtain the same overall image brightness as a camera with a lower QE value using longer exposure times. In general, shorter image exposure times will generally produce images with less noise than those acquired using long exposure times. Comparison images between the INFINITY3-3URC (left) and INFINITY1-3C (right), captured with identical gain and gamma settings. This comparison was done using two INFINITY microscopy cameras that have different quantum efficiencies and pixel sizes. Both of these images were captured on a microscope in the same environment, using the same light source and lighting conditions. At first glance the images do not appear to be that different in terms of brightness. However, in order to achieve this, the camera with a lower QE and smaller pixels (image shown on the right) required an exposure time of 4 times longer. The difference in exposure time illustrates how one camera is more sensitive than the other. Microscope cameras can be purchased with a range of pixel sizes which can alter the quality of images and the amount of light needed, what considerations are needed when buying a microscope camera? Larger pixels are typically more efficient at collecting the light than smaller pixels. Therefore the sensor with the smaller pixels will typically require longer exposure times to produce an image with the same brightness as a sensor with larger pixels. The challenge comes with the available surface area of a sensor chip. Larger pixels take up more real estate on the sensor than smaller pixels, and therefore you must either increase the overall sensor chip size or reduce the total number of pixels when pixel size is increased. An increase in the number of pixels on a sensor chip will generally provide a better ability to detect finer details present in the slide sample under the microscope. There are optical limitations to how much detail we’re able to capture through the microscope optics. As the magnification increases, the microscope’s field of view is reduced to a very tiny area. Not only does this reduce the amount of light available to the camera, but we also begin to approach the diffraction limits of light while attempting to resolve the tiniest objects. This means that when working at very high magnifications, a multi-megapixel sensor will generate large image sizes with no benefits in the level of detail in the image. At the same time, it will likely be less light sensitive than a lower resolution camera with larger pixels. Digital microscope cameras vary in terms of resolution. How do these parameters change the optimal sample that they are capturing? When using lower power magnification on the microscope (e.g. 2X, 4X, 10X), a camera with a greater number of pixels (e.g. 5 or 6 megapixels) will produce an image with increased detail. However, as the objective magnification increases, the field of view represented by the optics is reduced. A camera sensor with less megapixels will be able to capture the detail being delivered by the optics. So, if working routinely at higher magnification, it’s more beneficial to select a lower resolution camera to get the light gathering ability of larger pixels. 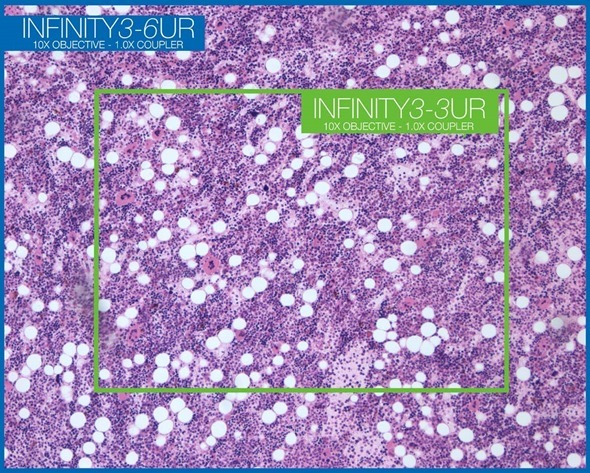 Field of view comparison between Lumenera’s INFINITY3-3URC and INFINITY3-6URC microscopy cameras. What is the dynamic range of a microscope camera? How does this affect the image quality? Dynamic range is an indication of how the camera sensor records information from dark areas and bright areas at the same time. The ratio shows the full well capacity of a pixel against the amount of noise present within the camera system. Images produced by a camera with a high dynamic range will typically have less noise discernible in the darker regions. To maintain a high sensitivity, noise should be kept to a minimum, what types of noise are there and how are they measured? Several different types of noise can contribute to overall camera performance, but the two main types of noise are characterized as read noise and dark current noise. Read noise is measured in electrons, and gets included in the sensor output as each image is acquired. The image data is produced as the sensor converts photons of light into electrons. Read noise that gets added to each image has a detrimental impact on image quality. Comparison of an image with a normal amount of noise (left) vs. an image with a lot of simulated noise (right). Both taken with the INFINITY1-3C. The dark current noise is dependent on both sensor temperature and exposure time, and is measured in electrons per second. Longer exposure images will accumulate more noise during the image acquisition. How can noise be reduced and what benefits are there to having a lower noise rate? A camera using a more light-sensitive sensor will acquire images with shorter exposure times than a less light-sensitive sensor, used under the same lighting and optical conditions. Increasing the amount of light that reaches the camera will result directly in reducing the exposure time and decreasing the amount of dark-current noise in the output. When light conditions cannot be increased and long exposure times are required, capturing and subtracting a dark-frame image is recommended. This is a technique that results in the dark current noise being removed from the image as a post-processing step. There is a balance between many of the camera features meaning that increasing one, for example resolution, will decrease others, for example pixel size and therefore light sensitivity. 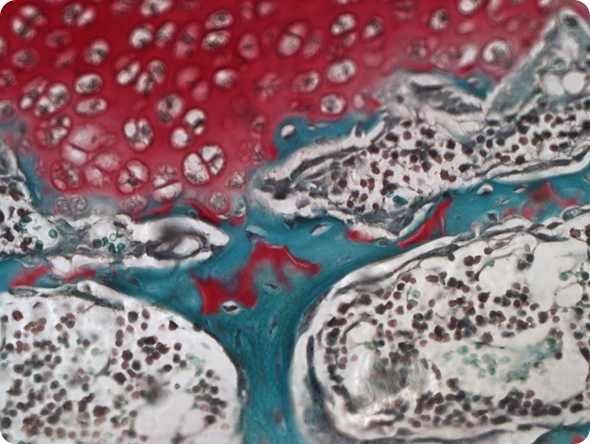 How can pathologists and applications scientists determine which features are the most important to optimize the image quality for their needs? If a camera is to be primarily used for fluorescence work (low illumination levels) at a high magnification (e.g. 60X or 100X), then it would be practical to select a very light-sensitive camera in the 1 to 2 megapixel range, with a large sensor size and large pixels. On the other hand, if the camera is to be used predominantly under brightfield illumination and at lower magnifications (e.g. 4X or 10X), then a multi-megapixel camera with smaller pixels would be suitable for producing images of high quality. In many cases, a lab will require a versatile camera that may be used for both brightfield and fluorescence imaging across a range of magnifications. This makes the camera selection more challenging, so it may be necessary to select more than one camera, or to find a compromise between light-sensitivity and resolution in a single camera. It may take some time to go over the camera datasheets to compare the performance characteristics of different camera options, especially when selecting a camera that must be suitable across a range of uses. 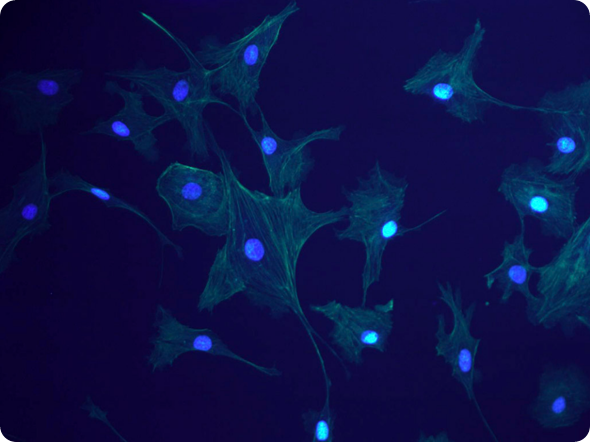 It is worth discussing the options with a representative or a dealer who is familiar with microscopy cameras to discuss your specific application, as they can assist you in understanding the options and alternatives available. 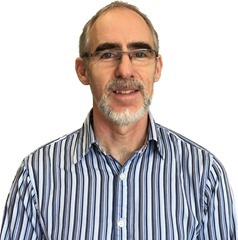 Since 2005, Ian’s role at Lumenera has been centered around the scientific customer by helping them select which cameras are most suitable for their applications, including digital pathology. He also offers global customer and sales support as part of the TAC team. As a Senior Applications Engineer, Ian is a product manager for the INFINITY ANALYZE software. His entire career has been focused in customer support and service and has been in the image processing industry since 1985.